Just as its name suggests, the kidney bean is shaped like a kidney with a reddish brown color and a thick skin. It has a strong flavor with a slightly sweet aftertaste, a nutty aroma and a chewy texture. 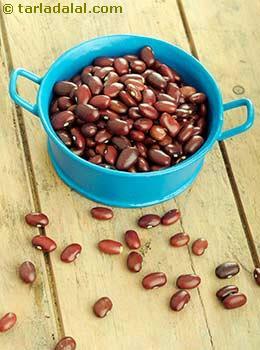 The kidney bean is used extensively in Mexican cooking, and also in certain Indian dishes. It is quite popular in Punjabi cuisine. The glycemic index of raw kidney beans for 1 serving size (approx. 30) grams is 19 which makes the glycemic load of 3.4. Is Kidney Beans, Rajma safe for Diabetics? Kidney beans contains significant amount of complex carbohydrates estimated to be around 18.1 in 30 grams which breaks down into simple sugar in your digestive tract and used as a major form of energy. This breaking down of complex carbohydrate takes place gradually because of the low glycemic index of 19 and glycemic load of 3.4 making it a healthier option to manage your blood sugar levels. Also its high fiber content plays an important role in maintain the blood sugar levels. Yes, its safe for Diabetics to have. Is Kidney Beans suitable for Weight Loss? Kidney beans is considered as the best source of dietary protein providing around 6.8 grams which makes it the best choice for vegetarians and those who are wishing to lose weight. Protein is an important macronutrient to consume and make it a part of your healthy weight loss plan because it will help you build lean muscle and lose fat. The fiber content in rajma provides satiety thus helping you avoid bingeing on other calorie laden unhealthy foods.